Gilbertstone Primary School has taken part in the biggest mass participation public art event ever! Our students have created designs to decorate an owl sculpture, the completed owls will be displayed in Birmingham over a 10 week period. We had some great designs and had to narrow down the best designs to just 12 pupils! 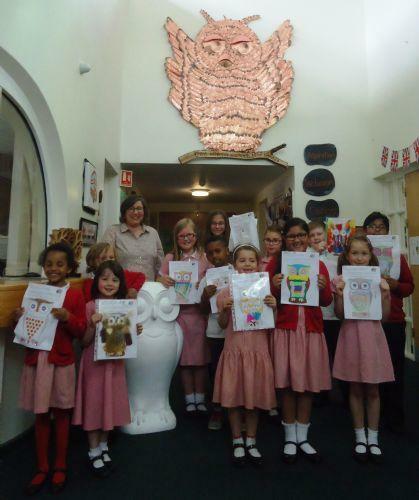 Below is a picture of the winners and Kate the artist who created our Golden Owl with help from Gilbertstone pupils. Over the next few weeks work will start on our new owl sculpture! For more information on the 'The Big Hoot' follow the link to the website below.